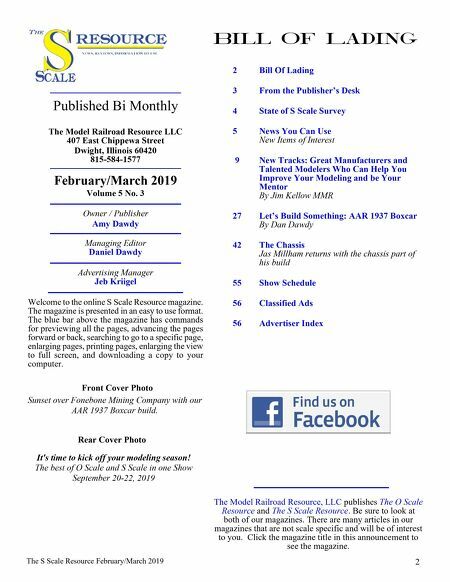 The S Scale Resource February/March 2019 2 2 Bill Of Lading 3 From the Publisher's Desk 4 State of S Scale Survey 5 News You Can Use New Items of Interest 9 New Tracks: Great Manufacturers and Talented Modelers Who Can Help You Improve Your Modeling and be Your Mentor By Jim Kellow MMR 27 Let's Build Something: AAR 1937 Boxcar By Dan Dawdy 42 The Chassis Jas Millham returns with the chassis part of his build 55 Show Schedule 56 Classified Ads 56 Advertiser Index Rear Cover Photo Bill Of Lading The Model Railroad Resource, LLC publishes The O Scale Resource and The S Scale Resource. Be sure to look at both of our magazines. There are many articles in our magazines that are not scale specific and will be of interest to you. Click the magazine title in this announcement to see the magazine. Published Bi Monthly The Model Railroad Resource LLC 407 East Chippewa Street Dwight, Illinois 60420 815-584-1577 Owner / Publisher Amy Dawdy Welcome to the online S Scale Resource magazine. The magazine is presented in an easy to use format. The blue bar above the magazine has commands for previewing all the pages, advancing the pages forward or back, searching to go to a specific page, enlarging pages, printing pages, enlarging the view to full screen, and downloading a copy to your computer. February/March 2019 Volume 5 No. 3 Managing Editor Daniel Dawdy Advertising Manager Jeb Kriigel Front Cover Photo It's time to kick off your modeling season! The best of O Scale and S Scale in one Show September 20-22, 2019 Sunset over Fonebone Mining Company with our AAR 1937 Boxcar build.